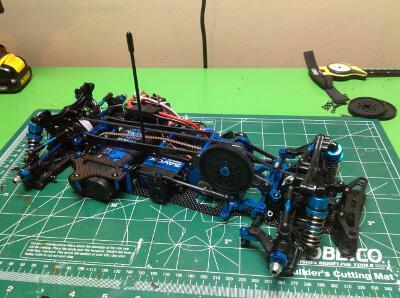 Note: This build log is excerpted from my web site . 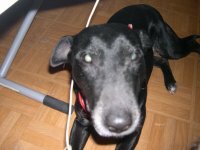 You can check there for larger versions of every photo or further reading. 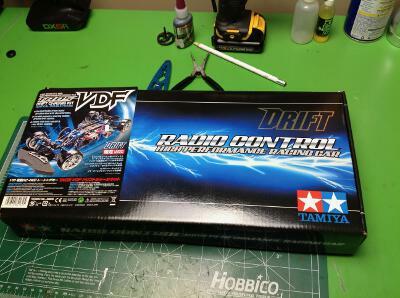 As far as I can tell, Tamiya started making drift chassis in about 2005 with the TT-01D which was a slightly modified TT-01. So what's the difference between a drift chassis and any other? The biggest obvious difference is the tires which are hard and smooth instead of soft rubber. This makes them slide and spin very easily. 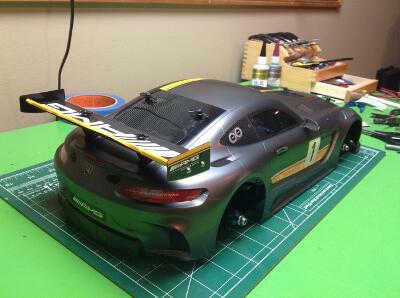 The TT-01D also added a motor heat sink and ball bearings to deal with running at high RPM so much. The TB-02D and TB-03D followed a few years later. They were similarly modified versions of the stock chassis which also included a range of upgrade parts including ball differentials. By 2010 they released the TA-05 VDF (vertical double frame) chassis which was actually custom made for drifting instead of being a slight modification of a standard chassis. This is a 4WD belt drive system (my first) with parallel axle steering and extended steering knuckles for increased lock angle. 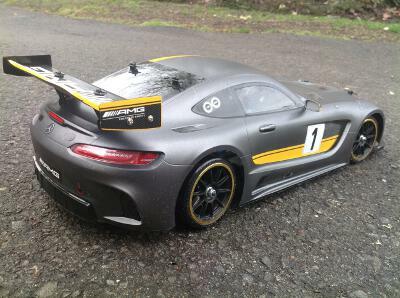 The kit is equipped like a TRF (Tamiya Racing Factory) chassis with the best versions of everything including lots of aluminum, carbon fiber chassis, and the best Tamiya shocks. The front uses a ball differential and the rear a locked spool. Other VDF chassis appeared later including a Version II of the TA-05. I got the older Version I on clearance for about 60% off, a price which I couldn't resist. As a chassis only kit, this did not come with wheels, tires, electronics, or body. 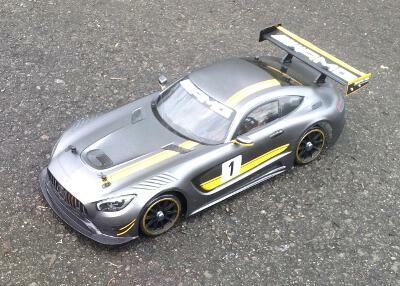 My local hobby store had an AMG GT3 body which I had been wanting anyway, so I chose that. 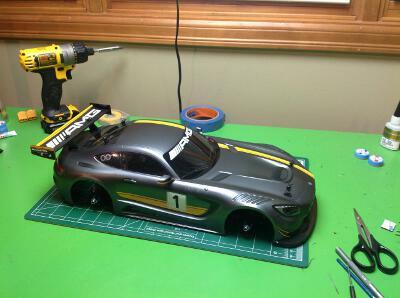 I can't imagine anyone would actually make a drift car out of a GT3 in real life, but it sure looks good. The choice of body determined my choice of wheels because I wanted the scale gold ring. 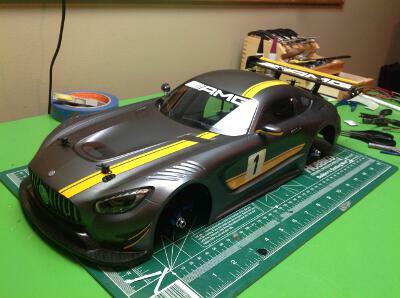 The tires are standard Tamiya driftech. I chose a high torque waterproof Savox servo mostly just because it has an aluminum blue case so looks good with everything else. 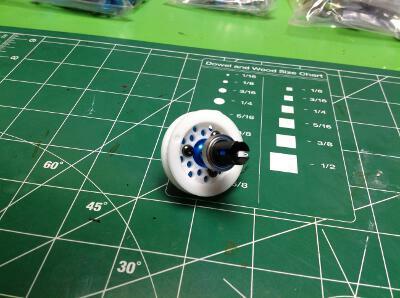 I wanted a reasonably high RPM brushless system, but the load isn't very high so I picked a Hobbywing Justock 3600kV combo. I can't claim to know much of anything about drifting so I am woefully unqualified to make comments on the performance of this car. As far as I can tell, it is real good. Drifts all over like crazy and is reasonably easy to control with some practice. So far, this is not a "countersteer" system with overdriven rear wheels, but I could easily do that by changing to a different rear pulley. There was no need to upgrade much of anything because the kit was spec'd so high to start with. I did add a swaybar that I happened to have available from another set and a new aluminum horn for the servo saver just because it looks cool. 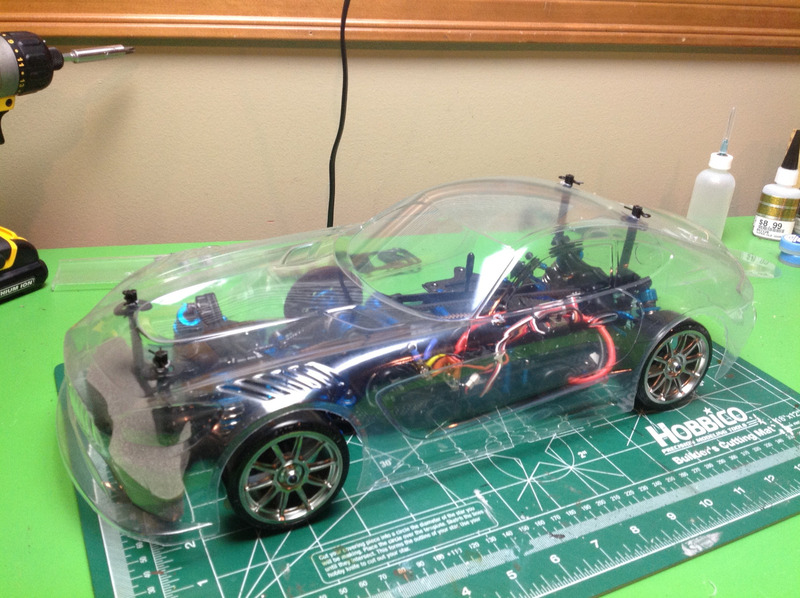 Since this kit is nothing but a chassis, it comes in a very small but beautiful resealable box. 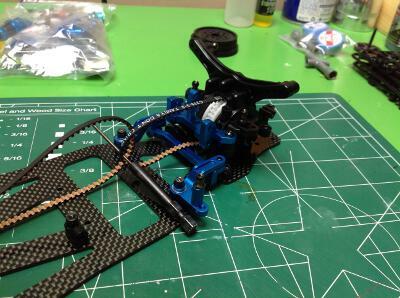 This is my first belt drive kit and my first "chassis only". I guess I am in the big leagues now. 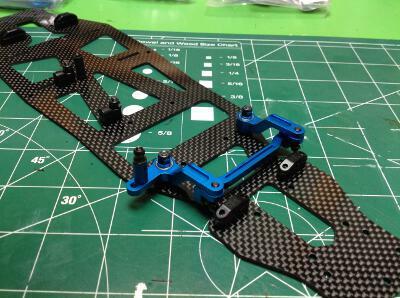 Construction begins by attaching a few platic blocks and the aluminum steering bellcranks to the carbon fiber lower deck. Everything is super light and well made. 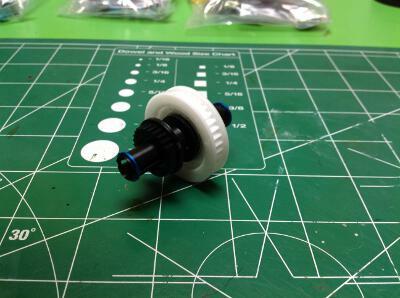 Unlike most Tamiya kits, this one comes with hex hardware instead of JIS Phillips screws. The steering arms even use ball bearings on the vertical posts. The rear differential is a locked spool. Whereas I am used to using a spur or bevel ring gear here, instead we have a pulley for the belt drive system. The right hand image shows the diff installed in the rear bulkhead with the shock tower attached. There is a cam system inside the bulkhead which can be used to tension the belt. The front differential is a ball type with adjustable slip. The bulkhead belt tensioning system is the same as the rear. 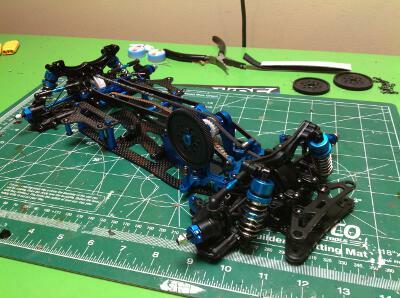 Note the blue aluminum rings around the drive cups which help retain the drive shafts when steering to large angles. With the front and rear assemblies installed, it is time to start on the center. The motor mount and center pulley configuration is really unique. 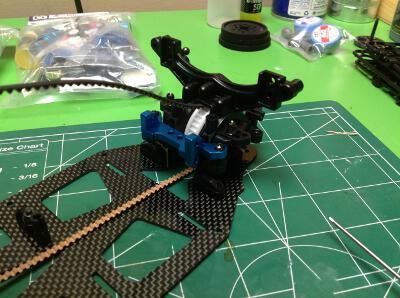 The motor is mounted very low and actually recesses into a slot in the lower frame but does not protrude below it. This keep the CG very low. The spur gear and center pulley need to be on a common axis, so they are actually installed above the motor so the belts will be high enough to clear everything else. The model uses 04 mod spur and pinion teeth, the smallest I've seen. This makes it easy to make big changes in ratio because there are so many teeth to work with. The stock spur is 120 teeth, but 112 and 128 are also included in the box. The stock pinion is 39 teeth. In the second image you can see a kink in the lower part of the rear belt. This is from a midspan roller used for tension and to reduce slap. Time to build the suspension. 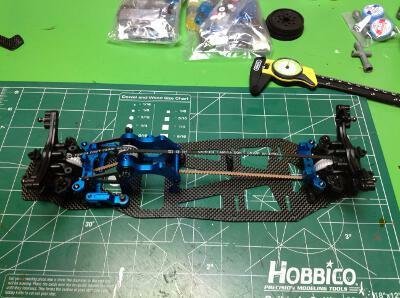 The reversible control arms are the same type used on other high end Tamiya touring car chassis. There are four shock attachment options per arm. The upper links are turnbuckles. The axles are all CVDs. The front steering hubs have aluminum extensions to give them more steering lock. The shocks are TRF spec, best you can get. 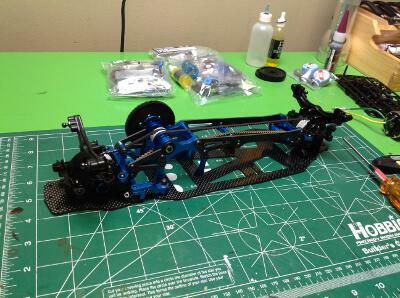 This is a beautiful chassis. Time for the power system. 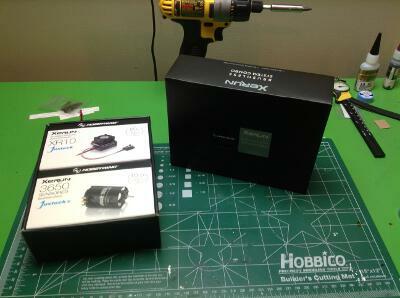 I chose a Hobbywing Xerun Justock brushless system with a 10.5T 3600kV motor. This will give me high RPM but is unlikely to draw a lot of current. As a sensored system, it should also offer very smooth throttle control. 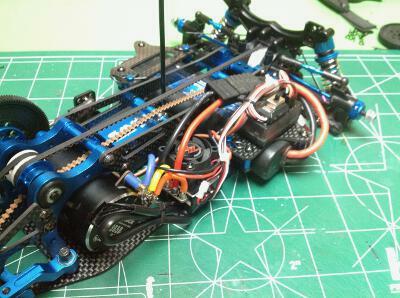 These images show all the electronics installed including the Savox steering servo, Hobbywing power system, and Wolfpack Li-Po battery mounted crossways. In the right hand image it all looks pretty tight. I soldered the wires as short as possible to try to keep everything tidy. Woohoo, it looks pretty nice. I can't wait to see your furious body custom. Up to this point I did not actually have a body or wheels and tires for this model. 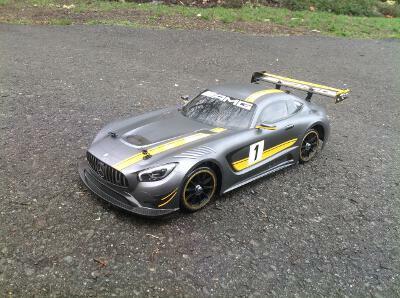 I found some temporary wheels and tires in stock locally to try out, and bought the AMG GT3 body which I hoped would fit. As you can see here in the test fit, it looks just right. Now I'll have to do some painting. 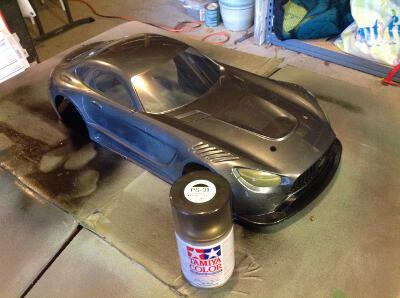 Finishing this body was not a particularly simple process. 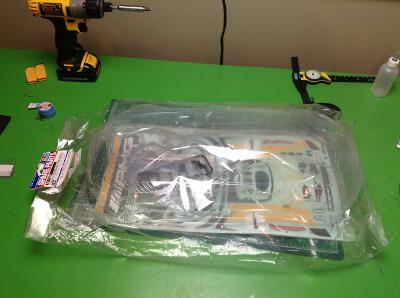 The picture on the left shows the bag in which the body comes packaged. Step 1 after unpacking is applying the window and headlight masks, then also masking the grille and bumpers which will be black. 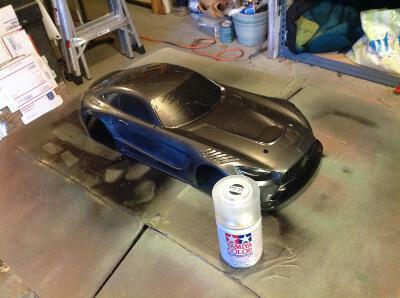 I put on the gunmetal gray polycarbonate paint first. The right hand image shows the results prior to removing any masking. 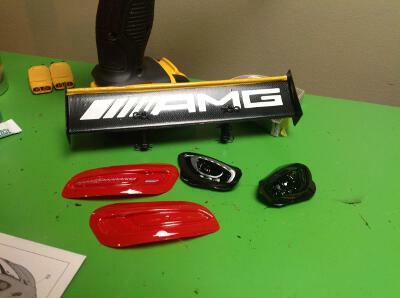 Next the masking is removed from the grille and bumpers so the black can be applied. After the black, the windows can be unmasked to apply PS-31 smoke. This gives a tinted effect to the windows so the wires inside are not so obvious. 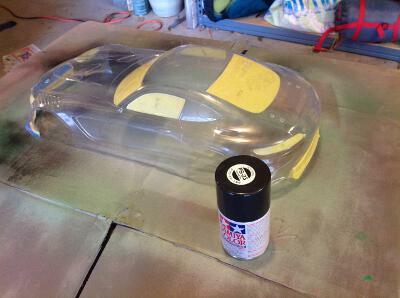 Clear bodies are always painted on the inside which results in a deep glossy finish. 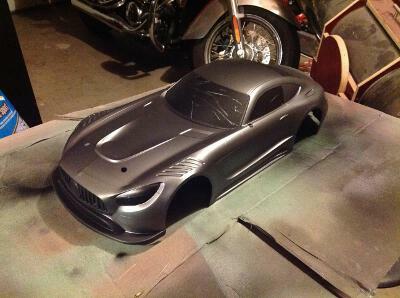 However, this model is supposed to have flat paint. To achieve that I removed the overspray film, then moved the window masks to the outside and covered the whole thing with flat clear spray. It worked perfectly. I almost didn't remember to mask the windows which would have made them cloudy. Wait, we're not done yet. The headlight and tail light lenses sit behind the body, so they need to be painted as well. 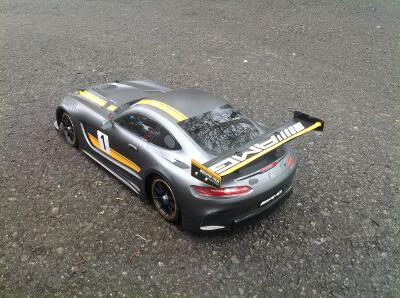 So does the rear wing which is assembled from several pieces. 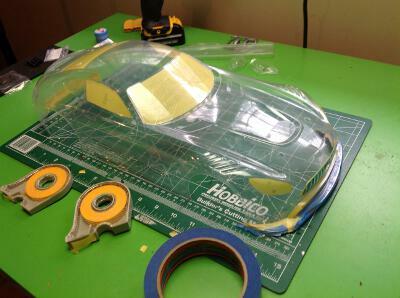 After that we need to put on the dozens of decals, including those tiny specs you see on the headlight lenses. 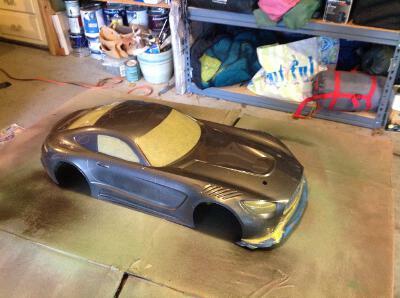 Here is the final results on the chassis. Without any wheels and tires (which hadn't arrived yet from Japan), the body sits flush on the ground. 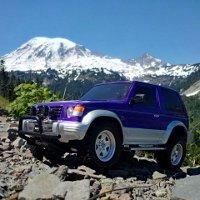 It would be another two weeks before the wheels would show up so I could actually drive it. This thing sure does look good. The gold rimmed wheels really complete the look. The problem with a good looking drift car is that drift cars smash into a lot of things as they are flailing wildly about. This will make it a challenge to keep it this nice. High end chassis. I like this style a lot. Also the body is done very well. If you wish to keep it this way, use another one to drift. Sooner or later you'll damage it. Do you drift outside? 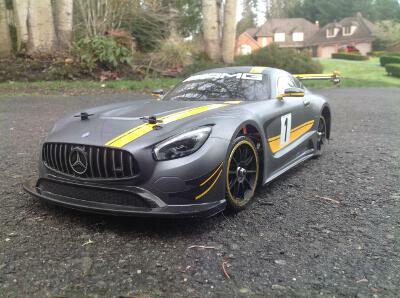 Don't you have a club nearby with polished concrete or carpet drift track? Gumpie22B wrote: High end chassis. I like this style a lot. Also the body is done very well. If you wish to keep it this way, use another one to drift. Sooner or later you'll damage it. Do you drift outside? 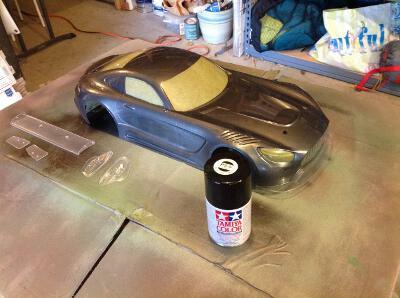 Don't you have a club nearby with polished concrete or carpet drift track? I drift outside on the road in front of my house. Sadly there are no nearby clubs. I did reinforce the lower splitter with Shoe-Goo to protect it, but I also just last week put regular tires on this car because I like it better as a touring car. I am making another dedicated drift car with countersteer.